The Bud Powell Biography presents an artist who continued his creativity evn through mental struggles! Born in New York City in 1924, Powell began piano lessons at age five. You know if a black dude is learning piano back in the 1920-30's he is going to be something "special"! 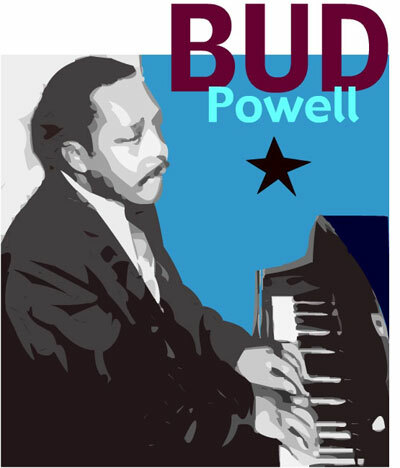 Studying the Bud Powell Biography you find by age ten, Bud demonstrated an ability to imitate legendary pianists like Art Tatum and Fats Waller. Powell considered Tatum his greatest influence and the only jazz pianist above his level technically. Monk was another primary influence and became Bud's friend and mentor, nurturing the pianist's blossoming talent. By 1941, Powell was landing gigs on the Harlem club scene and making a respectable name for himself. As a result, Duke Ellington's former trumpeter Cootie Williams asked Bud to go on tour with him. Powell agreed and the band headed south. Allegedly, he was drunk and disorderly, but the severity of the policemen's reaction was clearly beyond what that charge warranted. After the incident, Bud was incoherent and in great pain. Days later, when Bud didn't seem to improve, he went from hospital to hospital and eventually was institutionalized for several months. Despite his mental instability, Bud was still able to play the piano. You just could keep this cat down! Alto saxophonist Jackie McLean was a teenager at the time and a huge fan of Bud's. He began watching over his idol, who was having problems with drinking and with a habit of wandering aimlessly. At the keyboard, however, Bud needed no help. His meteoric rise to fame continued unabated, despite occasional setbacks due to his condition. Powell was one of the few musicians who could challenge Charlie Parker (left) musically, and Bud realized it. McLean recalls seeing the two jazz cats trading choruses in battles of virtuosity. Powell's momentum seemed unstoppable. He became the pianist of choice for tenor saxophonist Dexter Gordon, vocalist Sarah Vaughan and other luminaries. Tragedy struck again when Bud was hit on the head with a bottle in a bar fight.The dude just kept having bad luck! His psychiatric record led to a transfer to another mental institution, this time for 11 months. Bud underwent 40 treatments of electro-convulsive therapy, a new technique just being developed in the 1940s. As McLean recalls, "He was so messed up when he came out...I think they experimented on Bud." Despite the severity of this treatment, Bud's career picked up right where it left off when he was released. Pullman cites the next couple years as Bud's "absolute peak." Recognized as a great band leader and prolific composer, Powell collaborated with trumpeter Fats Navarro, a 19-year-old Sonny Rollins, bassist Tommy Potter, and drummer Roy Haynes in a 1949 session for the Blue Note label. Some of Powell's brilliant and personally revealing works included "Un Poco Loco," "Celia", "Hallucinations", "Oblivion", and "Wail." McLean notes the brighter side of Bud's music, "full of adventure, romance and beauty." In 1951, Powell was arrested with Thelonious Monk for drug possession. Charges against Bud were dropped, but he was sent to a psychiatric hospital for a year and a half. Finally, it all caught up to Powell and his life took a turn from which he would never fully recover. Its a true shame that the cat was being hustled from hospital to hospital, and back then the hospital treatment for blacks was not so "clean"! His playing throughout the 1950s was inconsistent -- sometimes great, often poor. Bud was also now under the watch of a guardian, known as "Buttercup," who purported to be Bud's wife. Because of his mental instability and tendency to wander aimlessly, Bud required some supervision, but compositions like "Glass Enclosure" make clear that Bud seriously lamented his loss of freedom. Buttercup moved Bud to Paris, where an adoring French public lavished praised on the pianist. As usual the jazz dudes were much more appreciated on European soil than back home where their jazz roots began... Bud enjoyed his five years in France, but was still unhappy with his lack of personal freedom. Then, Francis Paudras, a French fan, along with saxophonist Johnny Griffin, pulled Powell away from Buttercup. After recovering from a bout of illness, Bud began to write music again, including "In the Mood for a Classic," that Bud dedicated to the French people. Paudras organized a 6-week engagement at Powell's old haunt, Birdland, that turned out to be Bud's triumphant return to New York. Bud garnered more accolades from the press than he had in his entire career! His daughter Celia and her mother (Bud's true love) Mary Francis Funderburk were among the electrified Birdland audience that first night. But Bud's erratic side later re-emerged and the extended engagement was cut short. Back in New York, Bud lapsed back into his destructive tendencies, most notably alcohol dependency. Only two public performances followed the Birdland engagement, the last on May 1, 1965. The following year was a downward spiral; Bud died on July 1, 1966 of cirrhosis of the liver. He was just 41. As Haynes notes, had Powell lived longer and been better treated, "There's no telling what he would have developed into." But despite this tragic and premature end, Bud's immeasurable contribution and influence on other musicians is astounding. Perhaps no musician overcame more adversity to share his musical gift. McLean sums up his dear friend, "He was incredible...powerful, engaging and giving." A true jazz innovator and GENIUS... can you dig it?